By default the Entry ID starts at 1 and increments by 1 for each submission. If you want to start at a higher number you will need to increase the AUTO_INCREMENT value of the database table wp_quform_entries, this can be done using a tool such as phpMyAdmin or running a database query using a WordPress plugin. Most web hosts allow you access to the phpMyAdmin tool to manage databases, if you are unsure about this ask your host how to access it. 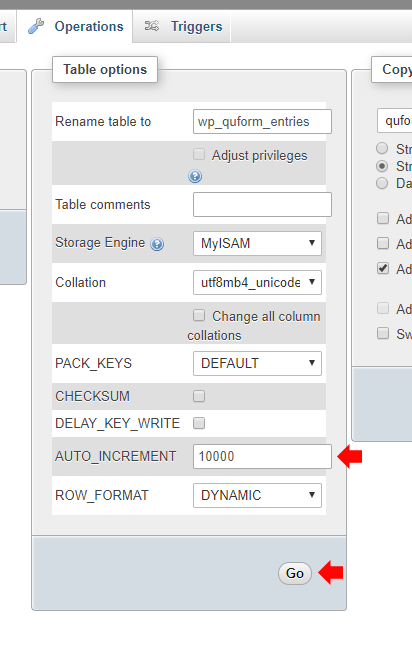 In phpMyAdmin go to the database containing the WordPress install and click on the table wp_quform_entries (note if the WordPress database prefix set during installation of WordPress is not wp_ then just find the table ending in _quform_entries). Then click on the Operations tab. At the AUTO_INCREMENT field enter a new starting number and click Go. The next submitted entry will have this number as the Entry ID and further submissions will increment this number by 1. 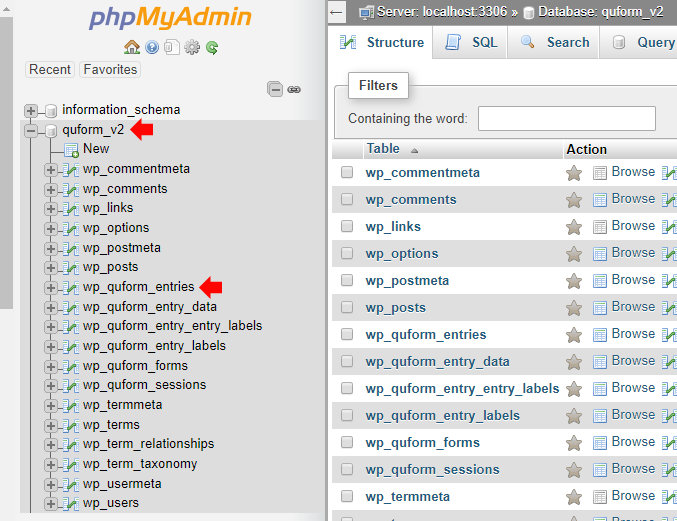 If you do not have access to phpMyAdmin you can use a WordPress plugin that is capable of running a MySQL query. Once such plugin that is capable of this is WP-DBManager. Once the plugin is installed, go to Database → Run SQL Query and in the query box enter the following code, then click Run. Replace the number 10000 with the desired starting number. Note if the WordPress database prefix set during installation of WordPress is not wp_ replace wp_ with the actual database prefix. The WP-DBManager plugin can then be uninstalled if it is no longer needed.